This post is part of SelectUSA’s EDO Spotlight series, highlighting the work of EDOs around the country recruiting foreign direct investment, how that work supports jobs and economic growth across the United States, and how SelectUSA partners with EDOs to support economic development. Recognizing the unique approach of a smaller municipality to engage in global trade and investment conversation, the City of Mentor has successfully conducted several trade-oriented seminars to inform area companies on the benefits of overseas business opportunities, pursued potential partners interested in FDI through annual trade missions to Germany and the United Kingdom, and marketed incentive programs essential to the success of those that would examine opportunities in Mentor. City officials regularly converse with companies, organizations, chambers of commerce, and overseas governments to explore mutually beneficial partnerships. In particular, the conversations and visits to the United Kingdom resulted in the negotiation and signing of a partnership memorandum with Medilink Midlands, a trade organization supporting more than 300 life sciences companies in the Midlands region of the UK. The Midlands region shares many similarities with Northeast Ohio: the development of a strong life sciences cluster among them, with companies in Mentor like STERIS and SourceOne and medical facilities nearby like the Cleveland Clinic, University Hospitals, and LakeHealth. The growing “special relationship” between Mentor and Medilink Midlands brought an inbound delegation of Medilink members and their Chairman, Keith Widdowson, to Mentor in October where potential FDI projects were considered. The City of Mentor arranged presentations by the Cleveland Clinic, STERIS, and other essential regional partners to tout the benefits of doing business in Mentor. As a component of the ongoing relationship, a delegation from Mentor will return to the UK to Medilink’s Med-Tech Expo in May to advance discussions and negotiations. City officials continue to converse with local partners to find linkages with Medilink’s members and encourage local businesses to accompany the City on its trade mission so those companies can find new markets in the UK. In Mentor’s case, it shows that the population size does not matter – with the right approach, personnel, resources, and initiative, a mid-sized municipality in the Midwest with a mighty economic engine can pursue FDI opportunities anywhere. Elise Buchen, Deanna Kuennen, Samantha Markman, and Laurence Reszetar promote the State of Minnesota to international business investors at the Minnesota Department of Employment and Economic Development’s Trade Office. Standing on Park Avenue in Faribault, Minnesota is just like standing on Park Avenue in New York: everywhere you turn you see successful global businesses. If you face east, you see the U.S. headquarters of a multi-generational Mexico-based company. Turn west, and you see the U.S. headquarters of a world-leading, high-tech French company. Look slightly northwest and there is a large warehouse teeming with traffic, which is owned by a German company. Just up Park Avenue, a large Japanese firm is building a state-of-the-art facility. Faribault is just like New York City… if New York City had a population of 24,000, was located an hour south of Minneapolis, and had a median house price of $182,400. The global headquarters of Sage Electrochromic Glass, a division of Saint-Gobain (France), is located in Faribault. Sage manufactures specialized glass that remains transparent even as it uses electrochromic technology to block out the solar radiation. Glass is expensive and difficult to ship, so you know it must be the high-quality if it’s being manufactured in Faribault and shipped around the world, from Dubai to Dallas. Faribault Foods, owned by La Costeña (Mexico), just completed its $150 million dollar investment in a first-of-its-kind, vertically-integrated food manufacturing plant in Faribault. When La Costeña made the decision to expand its facility, the opportunities in Faribault caught the company’s attention. Daikin Applied (Japan) just announced its $40 million expansion to build some of the most energy-efficient cooling HVAC units in the U.S. At the heart of the expansion was an unprecedented effort where the county, city, and local economic development authority jointly conducted hearings where the permits and incentives for the project were approved simultaneously by all three bodies. This gave the green light for the company to convert a vacant 300,000 square foot warehouse to a state-of-the-art manufacturing facility. A German-owned powerhouse in food distribution located on the banks of Interstate 35, Aldi Distribution provides a high-class warehouse and distribution facility for the multinational Aldi food stores. This was one of the first Aldi Distribution facilities in Minnesota. The company recently completed a 60,000 square foot expansion, further proving that Faribault can support the growth and expansion of global industries. Faribault’s small town pride shows in that nearly 1,350 Faribaultians work for these foreign-owned enterprises. They have titles like mechanical and quality engineers, production control analysts, and manufacturing services liaisons. It’s because of their commitment and the leadership of these global corporations that Faribault’s Small Town Pride creates Big City Opportunities that meet the world’s demands and continue to grow the world’s economy. Today, registration is open for the 2019 SelectUSA Investment Summit, and I am looking forward to another successful event connecting global business investors with growth opportunities in the United States. Next year’s Investment Summit will take place from June 10-12, 2019 in Washington, D.C. at the Washington Hilton. The 2018 SelectUSA Investment Summit attracted more than 3,000 participants, including more than 1,000 business representatives from 66 markets. Those participants include companies like Formosa Plastics, which attended the Investment Summit to find economic development connections in the United States before ultimately announcing a $9.4 billion investment in Louisiana. Grupo Bocar, a tier one automotive parts supplier, attended before deciding to invest $115 million in a facility in Alabama that will support 300 American jobs. The SelectUSA Investment Summit is where business potential meets business opportunity. Our global Commerce Department team recruits and engages with businesses from around the world that have the desire to invest and the ability to succeed in the United States. Economic development organizations (EDO) representing states and cities from around the country come to the Summit to showcase everything that makes the United States the world’s top destination for business investment. From decades of experience in the private sector, I’ve come to learn that you need the right people in the room to get deals done. The Investment Summit fosters and provides that environment. I invite any business that is looking to grow on a global scale to join me at the 2019 SelectUSA Investment Summit. I believe that the time you spend with our team, making connections at networking sessions, talking about opportunities in our matchmaking area, and learning about business trends in our Summit Academy, will pay dividends for years to come. More than 3,000 international business investors, U.S. economic developers, and more joined high-level government officials and Cabinet secretaries, global CEOs, and FDI thought leaders for the 2018 SelectUSA Investment Summit. Today, thousands of global business investors, U.S. economic developers, senior government officials and service providers concluded the 2018 SelectUSA Investment Summit, the premier foreign direct investment (FDI) event in the United States. The last three days culminated a year’s worth of hard work and collaboration, resulting in another successful Investment Summit that included several new investment announcements and the beginning of countless future partnerships. But most importantly, I have seen firsthand, the excitement and energy that the world has for investing and doing business in the United States. While this was my first Investment Summit as Acting Director, I am incredibly proud of our team’s work and dedication. This was one of SelectUSA’s largest Investment Summits. More than 3,000 attendees from all over the world joined SelectUSA at the Gaylord National Resort and Convention Center for one reason: FDI. And this Investment Summit has a history of delivering: Past attendees have announced nearly $93 billion in new investment projects, and Thursday alone, four companies announced more than $600 million in projects that will create about 650 U.S. jobs. This year’s theme, “Invest Here. Grow Here. Succeed Here,” focused on the connections between global commerce and U.S. communities. U.S. Cabinet secretaries, Governors, CEOs from Fortune 500 companies, FDI experts, and others provided attendees with insights into how FDI impacts a variety of sectors and fields, from the burgeoning commercial space industry to site selection. The Exhibition Hall—the networking hub of the Investment Summit—was full of U.S. economic development organizations (EDOs) from across the United States. Each EDO showcased investment opportunities their communities had to offer the international investors in attendance. This year’s event included more than 2,700 individual matchmaking meetings among the companies and EDOs in attendance. Indian steel company JSW announced a $500 million investment in Mingo Junction, Ohio, a town of just 3,300 people. Secretary Ross released SelectUSA’s new report on how FDI has benefitted rural America. The 2018 Investment Summit may have ended, but the work of maintaining U.S. leadership in FDI continues. It was a privilege to hear from and witness those on the front lines of FDI attraction and promotion: state and local-level EDOs. The United States would not be the top destination of FDI were it not for their work. SelectUSA is here to work with them, with you, and we’re here year-round to help in a variety of ways. Whether you’re a first-time business investor or an experienced economic development professional, SelectUSA can help connect you to the resources and information needed to make your investment a success. Next year’s SelectUSA Investment Summit returns June 10-12, 2019, at the Washington Hilton in Washington, D.C.
For more information on SelectUSA and its services, please visit www.selectusa.gov. I also invite you to follow SelectUSA on Twitter and sign up for email updates to stay in the know with us. This post contains external links. Please review our external linking policy. This post originally appeared on the Department of Commerce blog. From expansive freeways and bridges to thriving seaports and airports, infrastructure is the backbone of the U.S. economy, fueling U.S. competitiveness by creating efficient supply chains, reliable energy information, as well as modern and secure transportation systems. However, years of underinvestment in infrastructure have partially handicapped U.S. growth potential. As the United States now turns toward reinvesting in its infrastructure, there are countless business opportunities for domestic as well as international firms. The SelectUSA Investment Summit’s focus on infrastructure this year is demonstrative of the Trump Administration’s commitment to restoring the infrastructure of this country to its full potential, creating economic growth and American jobs in the process. On Friday, June 22, April Palmerlee, CEO of the American Chamber of Commerce in Australia, will lead a panel on rebuilding and modernizing America’s infrastructure at the 2018 SelectUSA Investment Summit. The panel will highlight President Trump’s “Building a Stronger America” initiative with a focus on regulatory reduction in the permitting process and creative financing, both key to addressing these needs through public-private partnerships as a source of funding at the state and federal levels. The U.S. Department of Transportation’s Build America Bureau will also lead a session during the Investment Summit Academy on Wednesday, June 20. Roger Bohnert, Director of the Office of Outreach and Development, will explain how local and state-level economic development organizations can find support for infrastructure projects through the Department of Transportation. The 2018 SelectUSA Investment Summit (June 20-22) is the highest-level foreign direct investment event in the United States. U.S. economic development organizations and international business investors will converge in Washington, D.C., to hear from industry experts and high-ranking government officials providing insight into several key areas of U.S. strength: workforce development, the burgeoning commercial space industry, and advanced manufacturing. This month, the SelectUSA team hit a major milestone, having now facilitated more than $30 billion in client-verified business investment projects. 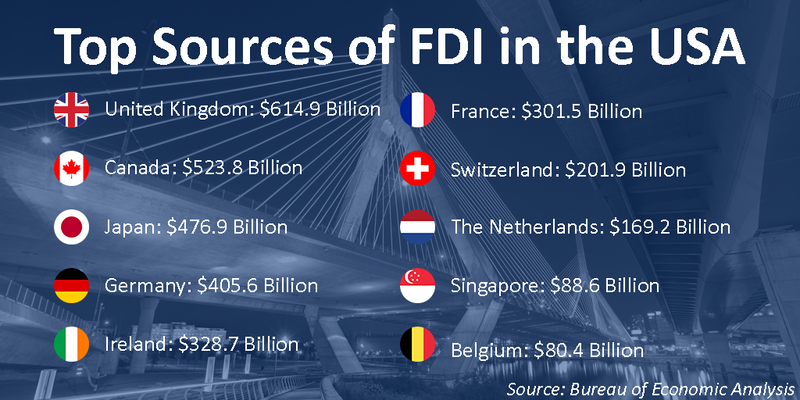 Foreign direct investment (FDI) in the United States is a key contributor to U.S. economic growth, directly and indirectly supporting nearly 13 million American jobs. It contributes to U.S. exports, drives innovation, and – most importantly – sends hardworking Americans home with a paycheck. Since 2007, the SelectUSA program has worked with thousands of clients – business investors, economic development organizations (EDOs), and other leaders – to support job-creating FDI in the United States. Just this month, the SelectUSA team hit a major milestone, having now facilitated more than $30 billion in client-verified business investment projects. This is the culmination of years of working with clients, hosting global business events, and working closely with American EDOs. Held the largest-ever SelectUSA Investment Summit, with more than 1,200 potential business investors and economic development representatives from 52 states and territories. Brought 10 European medical technology startups to Pittsburgh, Cleveland, and Austin as part of its first inbound investment mission. Hosted investment road shows in India and China that facilitated more than 300 meetings between EDOs and potential business investors. Released its first-ever research reports, analyzing the positive effects of FDI on manufacturing and high-tech industries. Led 20+ EDO delegations to some of the largest trade shows in the world, including Hannover Messe in Germany and BIO Korea. We were also happy to share many FDI success stories on the International Trade Administration blog. Swiss additive manufacturing company Oerlikon decided to invest $62 million in Huntersville, North Carolina, after attending the 2016 SelectUSA Investment Summit. A.T. Kearney ranked the United States as the world’s top destination for business investment for the 5th year in a row. And Mahindra recently shared its reasons for investing in the United States, creating jobs in Michigan. Our team at SelectUSA and our partners in the economic development community make this all possible. I thank them for their dedication and hard work. You may not have heard of SelectUSA, and you may not regularly think about the impact of FDI, but millions of U.S. workers rely on FDI for their livelihood. We are proud to support that, and we look forward to working with more clients and helping to create U.S. jobs. Learn more about the upcoming 2018 SelectUSA Investment Summit, June 20-22, in Washington, D.C. at selectusasummit.us. Visit selectusa.gov for more information about our services, events, and more. You can also follow us on Twitter @SelectUSA. You are currently browsing the archives for the SelectUSA category.